Mira Bow| Front Desk, Bridge, Credenza, Hutch with glass doors, Pedestal File and Lateral File with Wardrobe Unit in Medium Cherry.Shown with Mercado» Leather Series Chair. Mira Conference Table, Hinged Door Credenza and Presentation Board in Espresso Walnut. Shown with Mercado» Leather Series AL Chairs. Mira Reception Station with L| Shape Return, Two| Drawer Lateral File, Convenient Wardrobe Storage Unit and Bookcase. All pieces in Medium Cherry. MiraÍs classic design creates an elegant setting for any work environment. While Mira is very pleasing to the eye, by taking a closer look you will notice quality details that set it apart from its competition. Solid core writing surfaces are a full 1 5/8" thick and feature AA| grade North American veneers protected by a 100% UV| cured finish. Hutches feature stylish, frosted glass doors and fully finished interiors and backs. The finest quality workmanship, in| stock availability and affordability make it a very popular series. Mira conference tables deliver a timeless, transitional design with rugged construction that will stand up for years. Table surfaces are protected by a 5mm solid wood edge and barrel| shaped bases compliment the curved tops providing a sturdy foundation. Surrounding MiraÍs conference tables are a wide selection of storage and productivity elements that not only look great, but play a crucial role in promoting important decisions. Mira reception stations are the complete package: stylish, functional, durable, and affordable. Complete the setting with any of MaylineÍs lounge seating collections and accessories such as occasional tables and storage elements. From the minute your guests step through the door, they will know your company is committed to exceptional performance and positive results. Make that first impression count. Choose Mira reception stations. The Medium Cherry and Espresso finishes provide an elegant and classy look. When designing an office configuration for maximum performance, versatility and style, take a close look at the Mira collection. This executive class furniture is complete modular series of desks, conference tables, reception desks, lateral file cabinets, and office storage cabinets. We will be happy to help you design a desk configuration to fit your office and workplace needs. Functional and beautiful, affordable and always available the Mayline Mira discount office furniture has verified quality and value. The Mira Series has earned the VQV | Verified Quality and Value certificate. The Mira Series Typical MEL5 consists of a Desk Shell, a Return, a Pedestal Box/Box/File (for 36" Desk), and a Pedestal File/File (for Credenza/Return). The Mira Series EL6 a Peninsula Table, a Return, and a Pedestal File/File (for Credenza/Return). The Mira Series MELB5 consists of a Desk Shell, a Return, a Pedestal Box/Box/File (for Credenza/Return), and a Pedestal Box/Box/File (for 36" Desk) The Mira Series Typical MELB6 consists of a Peninsula Table, a Return, and a Pedestal Box/Box/File (for Credenza/Return). The Mira Series Typical MEU1 consists of a Desk Shell, a Credenza Shell, a Hutch, a Bridge, a Pedestal Box/Box/File (for 36" Desk), and a Pedestal File/File (for Credenza/Return). The Mira Series Typical MEU2 consists of a Peninsula Table, a Credenza Shell, a Hutch, a Bridge, and a Pedestal File/File (for Credenza/Return). The Mira Series Typical MEU3 consists of a Desk Shell, a Credenza Shell, a Bridge, a Pedestal Box/Box/File (for 36" Desk), and a Pedestal File/File (for Credenza/Return). The Mira Series Typical #13 consists of a Peninsula Table, a Credenza Shell, a Bridge, and a Pedestal File/File (for Credenza/Return). The Mira Series Typical #10 consists of a Desk Shell, a Credenza Shell, a Hutch, a Bridge, a Pedestal Box/Box/File (for 36" Desk), and a Pedestal Box/Box/File (for Credenza/Return). The Mira Series Typical #16 consists of a Peninsula Table, a Credenza Shell, a Hutch, a Bridge, and a Pedestal Box/Box/File (for Credenza/Return). The Mira Series Typical #8 consists of a Desk Shell, a Credenza Shell, a Bridge, a Pedestal Box/Box/File (for 36" Desk), and a Pedestal Box/Box/File (for Credenza/Return). The Mira Series Typical #14 consists of a Peninsula Table, a Credenza Shell, a Bridge, and a Pedestal Box/Box/File (for Credenza/Return). The Mira Series Bow Front Desk features a bow front surface and full height modesty panels. The Mira Series Typical #4 consists of a Desk Shell and two Pedestal Box/Box/Files (for 36" Desk). The Mira Series Typical #3 consists of a Desk Shell, a Pedestal Box/Box/File (for 36" Desk), and a Pedestal File/File (for 36" Desk). The Mira Series Bridge has universal mounting to the right or left side of the desk. It is not free standing and requires connection to the desk or credenza. It includes full-height modesty panel. Mayline Mira Collection - Mira's simple curves create an elegant setting for any work environment. The finest quality workmanship, in-stock availability and affordability make it a very popular office furniture series. Mayline Mira Collection - Mira's simple curves create an elegant setting for any work environment. The finest quality workmanship, in-stock availability and affordability make it a very popular office furniture series.d highlight the natural wood grain. The Mira Series Typical #32 consists of a Corner Table, two Returns, and two Pedestal Box/Box/Files (for Credenza/Return). The Mira Series Typical #30 consists of a Corner Table, two Returns, and two Pedestal Box/Box/Files (for Credenza/Return). The Mira Series Peninsula Desk is Free Standing. It has a modesty panel that is 14 1/2"H. The Mira Series Straight Front Desk features a straight front surface and full height modesty panels. The Mira Series Hutches has four cabinet styled doors with self-closing hinges and a 20 1/2" clearance between the work surfaces and storage bin. The back panel features lower and upper cable grommets. Optional wood doors available. It comes fully assembled except the doors The Mira Series Return has a choice of the Left-Hand or the Right-Hand model. It features an end panel with a reeded edge and it includes a full-height modesty panel. The Mira Series Return has a choice of the Left-Hand or the Right-Hand model. It features an end panel with a reeded edge and it includes a full-height modesty panel. The Mira Series Pedestal Files for Credenza/Return and 30"D Desks have drawer interiors that are finished to match the exterior veneer. The drawers operate smoothly using full-extension ball-bearing suspensions. The Gang-lock features a removable core. There is a choice of two styles featuring two file drawers or two box drawers and one file drawer. The file drawers accommodate letter or legal size hanging file folders. The Mira Series Pedestal Files for Credenza/Return and 30"D Desks have drawer interiors that are finished to match the exterior veneer. The drawers operate smoothly using full-extension ball-bearing suspensions. The Gang-lock features a removable core. There is a choice of two styles featuring two file drawers or two box drawers and one file drawer. The file drawers accommodate letter or legal size hanging file folders. The Mira Series Pedestal Files for Desk-36" have drawer interiors that are finished to match the exterior veneer. The drawers operate smoothly using full-extension ball-bearing suspensions. The Gang-lock features a removable core. There is a choice of two styles featuring two file drawers or two box drawers and one file drawer. The file drawers accommodate letter or legal size hanging file folders. It is designed for use under a 36" desk or return. The Mira Series Pedestal Files for Desk-36" have drawer interiors that are finished to match the exterior veneer. The drawers operate smoothly using full-extension ball-bearing suspensions. The Gang-lock features a removable core. 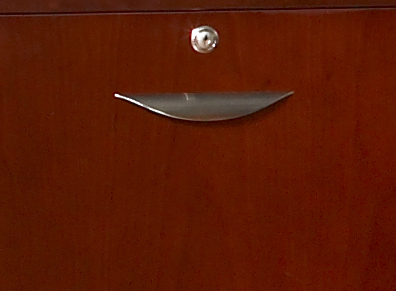 There is a choice of two styles featuring two file drawers or two box drawers and one file drawer. The file drawers accommodate letter or legal size hanging file folders. It is designed for use under a 36" desk or return. The Mira Series Credenza has a full-height modesty panel and a reeded edge matching desk detailing. The Mira Series Bookcases have open shelves for convenient storage. There are choices of two, four or five shelf units. They have adjustable shelves that are 1" thick. The Mira Series Bookcases have open shelves for convenient storage. There are choices of two, four or five shelf units. They have adjustable shelves that are 1" thick. The Mira Series Bookcases have open shelves for convenient storage. There are choices of two, four or five shelf units. They have adjustable shelves that are 1" thick. The Mira Series Hinged Door Credenza has an interior finished to match exterior veneer. The Gang-lock features a removable core enabling keyed-alike suites. There is one adjustable shelf. The Mayline MIRA office furniture collection includes office storage cabinets feature wood veneer work surfaces, hardwood detail for style, and a catalyzed lacquer finish to protect and highlight the natural wood grain. This MIRA discount office furniture will make a quality statement to your clients and associates. The Mira Series Letter Tray is sized to fit into the space between the doors and the work surface. Mayline Mira Office Furniture The Mira Series Hinged Door Credenza has an interior finished to match exterior veneer. The Gang-lock features a removable core enabling keyed-alike suites. There is one adjustable shelf. performance, versatility and style, take a close look at Mira. Mayline Mira Office Table - End / Side Table 24" x 24"
The Mira Series Lateral File-2 Drawer comes with an unfinished top. It must be installed under a credenza. The Gang-lock features a removable core enabling keyed-alike suites. The drawers operate smoothly using full-extension ball-bearing suspensions. It includes a counter-weight for stability when in use and it accommodates letter and legal size hanging file folders. There is an optional top for the lateral file available. The Mira Series Occasional Tables have surfaces offered in Medium Cherry finish on Cherry Veneer. The Mira Series Reception Station is available in Medium Cherry finish on Cherry veneer. All of the Mira Reception Stations (except MRS7278D) include a center drawer. It has non-handed returns and is available in one color. It is configured as either a freestanding double-pedestal desk station, or complete with a non-handed return. An optional glass counter top is available. The Mira Series Reception Station is available in Medium Cherry finish on Cherry veneer. All of the Mira Reception Stations (except MRS7278D) include a center drawer. It has non-handed returns and is available in one color. It is configured as either a freestanding double-pedestal desk station, or complete with a non-handed return. An optional glass counter top is available. The Mira Series Reception Station is available in Medium Cherry finish on Cherry veneer. All of the Mira Reception Stations (except MRS7278D) include a center drawer. It has non-handed returns and is available in one color. It is configured as either a freestanding double-pedestal desk station, or complete with a non-handed return. An optional glass counter top is available. Mira offers a transitional design thatÍs equally suitable for formal, casual, conservative and cutting| edge offices. The refined appearance masks a rugged construction that will stand up to years of heavy use. Modular, non| handed components maximize desk and reception station flexibility while cleverly engineered table bases enhance technology integration. Product Description | The Mira Series is a transitional line of wood office furniture for executive offices, individual workspaces, conference rooms and reception areas. Surfaces | Mira desking and conference surfaces, and cabinet tops are 1 1/2" thick with a flat, hardwood edge. Veneer | AA| grade North American hardwood veneers on writing surfaces and cabinet tops under 50"H. Custom| grade veneer used on all other surfaces. Core Material | 41 lb/ft density particleboard core. CARB 2 compliant. Finish Specifications | UV| finish with a 3H hardness. Gloss level ranges between 45| 55. Crosshatch adhesion = 5B rating. Provides a 20 lbs. direct impact rating. Standard Finishes | Choice of Medium Cherry finish on cherry veneer and Espresso finish on walnut veneer. Chassis Construction | Assembles easily via REAL Office » CAM Fastener System. All base units have adjustable leveling glides to accommodate uneven floor surfaces. Pedestals and Laterals | All drawer fronts have matching vertical grain. Lateral files feature anti| tipping drawer interlock system that allows only one drawer to be opened at a time. File drawers provide letter filing front to back or legal filing side to side. 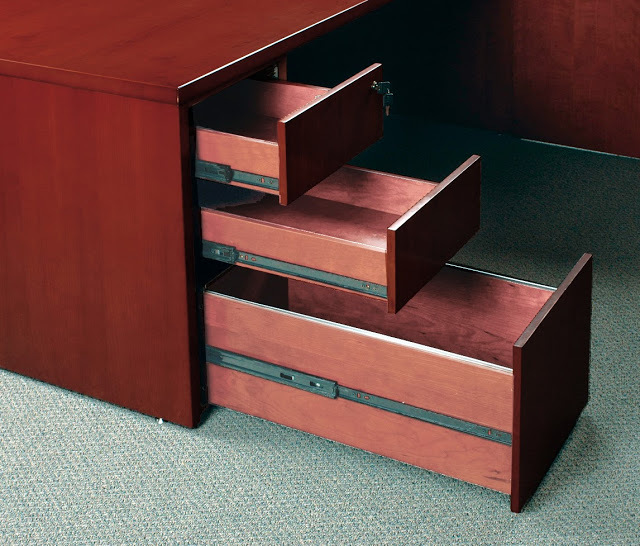 Drawer Suspension | Box and file drawers feature heavy duty, full extension ball bearing slides for smooth operation and full access to drawers. Locking | Locking is standard for all pedestals and laterals. Locks are keyed alike, however lock cores are removable for keying offices individually. 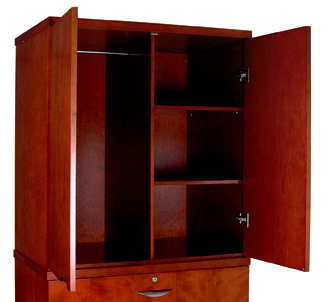 Storage Cabinets | Cabinet doors have integrated, recessed pulls designed into the face of the doors. All cabinet doors utilize pre| installed, self| closing, full or half overlay European style hinges for superior door alignment. Interior cabinet shelves are height adjustable in 1.25" increments. Hardware | Mira drawer fronts have standard silver pulls. Additional pull options are available, REAL Office Options program.